The charity has put 17 homes up for sale. Concerns have been raised over the future of much loved care homes which have been put up for sale by a charity. Leonard Cheshire, a charity set up by a former RAF pilot after the Second World War, has announced that 17 of its homes for disabled people will be sold. Homes in Leeds, York, Calderdale, and Sheffield are among those being put on the market as Leonard Cheshire seeks a new provider to keep the homes open. They include Champion House, which provides residential and respite care for up to 27 people in Calverley, Leeds. Calverley and Farsley councillor Peter Carlill said: "This is certainly a worry for the local area. It's a surprise to me. The home is a really important service for the community. "They hold a summer fair which is a huge community event, not just for the people who live there but for the whole village. "The home is in a really lovely location and it's a great place for people to be able to spend their time." Some people living at Champion House have their care home places funded by Leeds City Council. Also up for sale is Alne Hall, near York, which provides support for up to 30 adults with physical disabilities. Kevin Hollinrake, the Thirsk and Malton MP, said the home had been open since the 1950s. He said: "For all of my lifetime the home has been part of the community in Alne. It is sad news, although it is good at least that it will be sold on as a going concern. "Hopefully staff and residents will continue to live and work at the home and the service will continue in the same fashion as it is at present. "It is a concern for the people that live there, their families and the staff, who do a brilliant job." In a letter to Mr Hollinrake, Leonard Cheshire said the home was expected to be sold early next year. The letter, from Executive Director Hugh Fenn, said: "I can assure you that we will work hard to ensure the transition to a new provider is as smooth as possible for staff, residents and other people connected with the service." Leonard Cheshire said proceeds from the sale of the homes would be reinvested into expanding its services for disabled people. 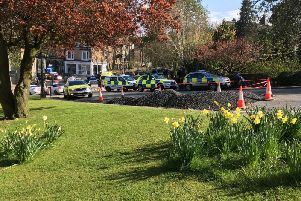 A spokesperson said: "We know this is a difficult and worrying time for many, including the residents and their families, and we will be supporting them throughout this process. "The continuity and quality of support, and the welfare of all residents is our top priority during this period as we look to secure a new provider." Leonard Cheshire Disability runs 163 supported living, residential, nursing and day centre facilities in the UK. The charity also runs education programmes in 13 countries in Africa and Asia. War veteran Leonard Cheshire was born in 1917 and served in Bomber Command, flying a record one hundred operational missions. He founded the charity after opening his home to Arthur Dykes, a disabled veteran dying of cancer who had nowhere else to go, in 1948.